We had a lovely communion service at our church Friday morning to mark Good Friday. During the service our pastor read from Matthew 27, starting at verse 11. As he read, one part really caught my attention. "When Pilate saw that he was getting nowhere, but that instead an uproar was starting, he took water and washed his hands in front of the crowd. “I am innocent of this man’s blood,” he said. “It is your responsibility!” "(Matthew 27:24). "I am innocent of this man's blood," Pilate claimed. Well, that's not true, is it? If we look only at the events that were happening, Pilate claimed he was innocent because the crowd demanded Jesus' death. Really, though, Pilate chose to give in to those demands. He chose to allow an innocent man to be crucified merely to satisfy the demands of a mob and prevent "an uproar". A ceremonial washing of his hands could not wash away his guilt. But beyond the events of the story, Pilate cannot claim to be innocent of Jesus' blood. None of us can. The simple truth is that every person ever born, except Jesus Himself, is guilty of sin. "The Lord looks down from heaven on all mankind to see if there are any who understand, any who seek God. All have turned away, all have become corrupt; there is no one who does good, not even one" (Psalm 14:2,3). All have turned away, all have become corrupt; there is no one who does good, not even one. None of us can claim to have never done wrong. No matter how much we try to be good people, there are still times when we think or do things that are wrong. Pilate didn't understand what was really happening in Jerusalem that day. He thought he could claim innocence because the crowd was demanding Jesus' death. Really, though, he was just as guilty as the religious leaders who were inciting the crowd to hate Jesus. And we are just as guilty as all of them. Jesus died for all the sins of everyone, everywhere, which means we are all guilty. The good news is that the story doesn't leave us stuck at guilty. Jesus died because of our sins, yes, but that's not the end. Adam's sin brought sin to all of mankind and made all of us sinners. There was no escaping that death sentence...until Jesus. We are all guilty of causing His death, and yet His death is what gives us forgiveness. "For just as through the disobedience of the one man the many were made sinners, so also through the obedience of the one man the many will be made righteous" (Romans 5:19). When we believe that Jesus died for us, our sins are forgiven and our relationship with God is restored. Only when we acknowledge our guilt can we accept Jesus as Savior. 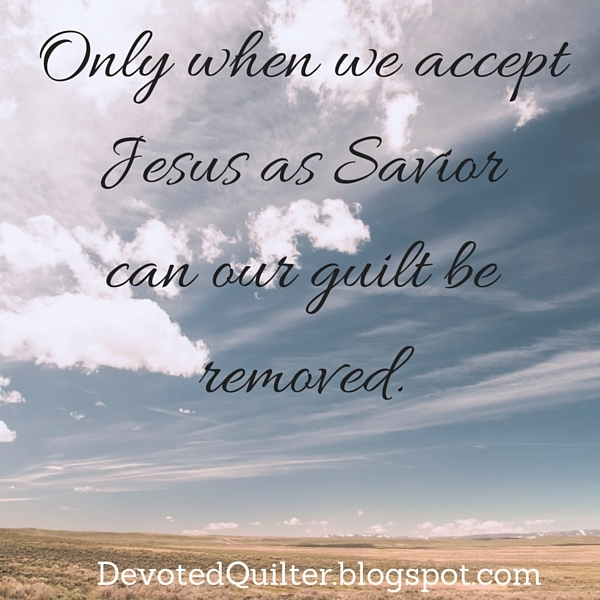 And only when we accept Jesus as Savior can our guilt be removed.